Start off your visit on the 4th (Fri): take a stroll through Fisherman's Wharf, then head off the coast to Alcatraz Island, and then take in the views from Golden Gate Bridge. To find other places to visit, more things to do, and other tourist information, go to the San Francisco trip planner . The Route module can give you travel options from your home to San Francisco. Expect a daytime high around 59°F in January, and nighttime lows around 46°F. Wrap up your sightseeing on the 4th (Fri) to allow time to travel to Los Angeles. Kick off your visit on the 3rd (Thu): get your game on at The Escape Game Austin. Keep things going the next day: take an in-depth tour of Bullock Texas State History Museum, then trek along Lady Bird Lake Hike-and-Bike Trail, and then get a sense of history and politics at Texas State Capitol. To see other places to visit, more things to do, ratings, and more tourist information, you can read our Austin travel route planner . Traveling by flight from San Francisco to Austin takes 6 hours. Alternatively, you can do a combination of subway and flight; or drive. Traveling from San Francisco to Austin, you'll lose 2 hours due to the time zone difference. Expect little chillier evenings in Austin when traveling from San Francisco in January, with lows around 41°F. Cap off your sightseeing on the 6th (Sun) early enough to travel to Chicago. A huge and vibrant city, Chicago is home to top-notch theaters, shops, museums, galleries, and restaurants. Start off your visit on the 6th (Sun): admire the landmark architecture of Skydeck Chicago - Willis Tower, then engage your brain at Museum of Science and Industry, and then admire nature's wide array of creatures at Shedd Aquarium. Get ready for a full day of sightseeing on the next day: appreciate the extensive heritage of Millennium Park, then appreciate the history behind Cloud Gate, and then admire the masterpieces at The Art Institute of Chicago. For more things to do, photos, reviews, and tourist information, use the Chicago online sightseeing planner . You can fly from Austin to Chicago in 5 hours. Other options are to do a combination of bus and flight; or drive. Traveling from Austin in January, expect Chicago to be colder, temps between 32°F and 18°F. Wrap up your sightseeing on the 7th (Mon) early enough to travel to New Orleans. On the 8th (Tue), contemplate in the serene atmosphere at St. Louis Cathedral, then brush up on your military savvy at The National WWII Museum, and then appreciate the extensive heritage of Garden District. Keep things going the next day: stroll through New Orleans City Park, look for gifts at Faulkner House Books, and then get to know the fascinating history of French Quarter. To find photos, ratings, maps, and other tourist information, you can read our New Orleans visit app . You can fly from Chicago to New Orleans in 4.5 hours. Other options are to drive; or take a train. Prepare for warmer weather when traveling from Chicago in January: high temperatures in New Orleans hover around 59°F and lows are around 51°F. Cap off your sightseeing on the 10th (Thu) early enough to travel to Miami. On the 10th (Thu), appreciate the history behind Holocaust Memorial, then take a stroll through Lincoln Road, then kick back and relax at South Beach, and finally wander the streets of Art Deco Historic District. 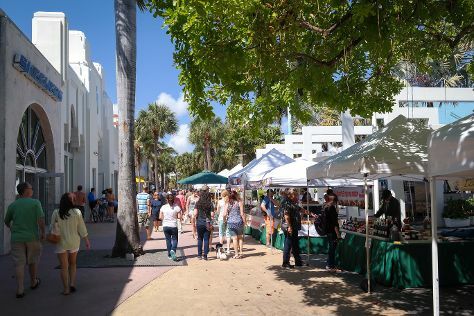 On the next day, examine the collection at Vizcaya Museum and Gardens, then take in the waterfront at Miami Beach Boardwalk, and then browse the different shops at Bayside Marketplace. To see reviews and more tourist information, go to the Miami online road trip planner . Traveling by combination of flight and tram from New Orleans to Miami takes 4 hours. Alternatively, you can do a combination of flight and bus; or drive. Traveling from New Orleans to Miami, you'll lose 1 hour due to the time zone difference. Expect somewhat warmer temperatures when traveling from New Orleans in January; daily highs in Miami reach 77°F and lows reach 63°F. Cap off your sightseeing on the 11th (Fri) early enough to travel to Washington DC. Start off your visit on the 12th (Sat): explore the world behind art at National Gallery of Art, then see the interesting displays at National Air and Space Museum, then appreciate the history behind Vietnam Veterans Memorial, and finally get a sense of history and politics at White House. Here are some ideas for day two: pause for some photo ops at Lincoln Memorial, then try to win big at Horseshoe Casino, and then learn more about the world around you at Smithsonian National Museum of Natural History. To find maps and other tourist information, refer to the Washington DC holiday app . Fly from Miami to Washington DC in 4.5 hours. Alternatively, you can do a combination of flight and train; or drive. Traveling from Miami in January, things will get much colder in Washington DC: highs are around 44°F and lows about 29°F. Wrap up your sightseeing on the 13th (Sun) early enough to take a train to Philadelphia. Start off your visit on the 14th (Mon): get engrossed in the history at Eastern State Penitentiary, then admire the masterpieces at Barnes Foundation, then steep yourself in history at Liberty Bell Center, and finally get a sense of history and politics at Independence Hall. To find ratings, where to stay, photos, and other tourist information, go to the Philadelphia planning website . Take a train from Washington DC to Philadelphia in 2 hours. Alternatively, you can drive; or take a bus. In January, daily temperatures in Philadelphia can reach 41°F, while at night they dip to 26°F. Finish your sightseeing early on the 15th (Tue) so you can take a bus to New York City. New York City is known for museums, nightlife, shopping, historic sites, and parks. Your plan includes some of its best attractions: take in the pleasant sights at Central Park, see the interesting displays at 9/11 Memorial, admire the landmark architecture of Grand Central Terminal, and get great views at Top of the Rock. To see reviews, other places to visit, more things to do, and tourist information, use the New York City online road trip planner . You can take a bus from Philadelphia to New York City in 1.5 hours. Alternatively, you can take a train; or drive. January in New York City sees daily highs of 40°F and lows of 24°F at night. Finish your sightseeing early on the 19th (Sat) so you can travel back home.